This basalt filter cartridge is at the heart of the Evapolar evaporative cooler. 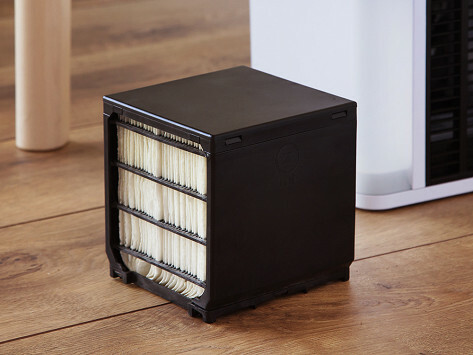 Its eco-friendly, biodegradable design blocks dust and prevents mold and bacteria from building up inside the unit—so you get to experience cool, clean air. Evapolar is a personal evaporative cooler that combines the portability of a fan with the cooling power of an air conditioner. And it has the moisture-boosting benefits of a humidifier, too. The built-in water reservoir saturates a basalt filter (made from igneous rock and glass), creating the cool evaporation. A fan helps circulate that fresh, moist air up to about 45 square feet around you—perfect for a desktop or small room. Biodegradable basalt is a natural material that filters dust from the air, and it prevents mold and bacteria from growing inside the unit. That makes the cool air cleaner. Eugene Dubovoy and Vladimir Levitin were looking for a better way to beat the heat at work. They based Evapolar on the same system used in the Russian subway, and gave it a scaled-down, eco-friendly design. You can even charge the device via USB to create the perfect personal climate just about anywhere.